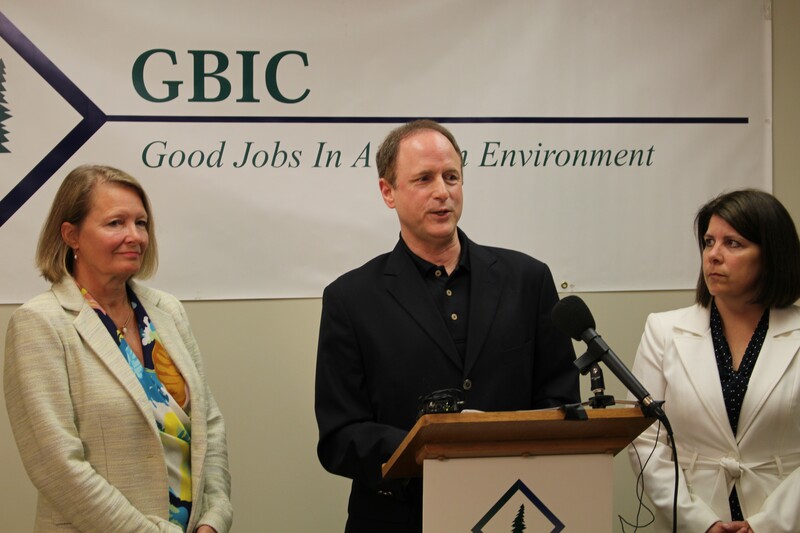 Vermont Business Roundtable president Lisa Ventriss, Greater Burlington Industrial Corporation president Frank Cioffi and Vermont Chamber of Commerce president Betsy Bishop address rumors of an IBM sale of its chip-making division. Since the Wall Street Journal reported in April that California-based GlobalFoundries had become the leading candidate to buy IBM's chip-making operations, Vermont politicians and economic development officials have been sweating bullets over the fate of IBM's Essex Junction plant. But whether and when a deal might go down — and what that might mean for IBM's estimated 4,000 Vermont jobs — has been anything but clear. "The media keeps reporting that the IBM campus is rumored to be sold. 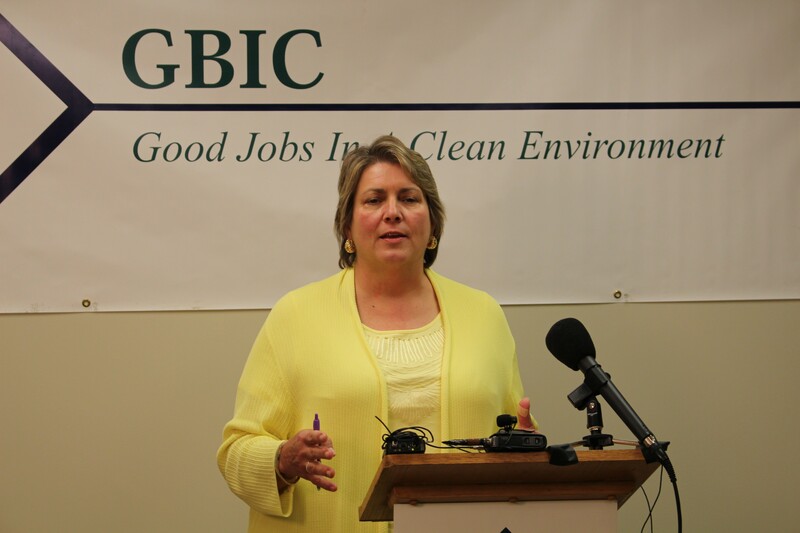 None of us know this," Greater Burlington Industrial Corporation president Frank Cioffi said Monday during a press conference at GBIC's Burlington headquarters. "These are public corporations, and none of us are going to know anything until it really happens." So what exactly prompted Cioffi to convene the media to discuss steps the state might take to keep IBM, or at least its workers, in Vermont? "Just rumors are abounding everywhere," he said. Asked again, Cioffi tipped his hand a little more. "I can tell you, from my standpoint, it's June 23 — and earnings reports come out really soon," he said. "So if you understand public corporations, then actions one way or the other sometimes happen after earnings reports." IBM is scheduled to announce its second-quarter earnings on July 17. Pat Moulton, the state's newly-minted secretary of commerce, said that she, too, had heard nothing concrete since Bloomberg reported nearly two weeks ago that IBM "is nearing a deal" with GlobalFoundries for its chip business. "No, there isn't anything new that any of us are aware of that I can see... that's triggered today's press conference," she said, after leaving her seat in the audience and stepping up to the podium to address the speculation. "So I don't think there's any heightened level of concern, certainly. But also, secondly, we could hear news that's actually positive for Vermont. We don't know yet." What exactly would constitute good news, given Bloomberg's reporting that GlobalFoundries is "primarily interested in acquiring IBM's engineers and intellectual property, rather than manufacturing facilities?" "Status quo and continued growth at IBM, partnerships — strategic partnerships — I don't know," Moulton said. "Any of our imaginations could go wild with this. But there could be a buyer who says, 'We want to keep things just as they are.' Who knows? And the speculation is difficult, because there are so many scenarios." Moulton said that her boss, Gov. Peter Shumlin, has been preparing for a variety of scenarios and is ready to spring into action as soon as the situation becomes more clear. She pointed to the creation of a $4.5 million Vermont Enterprise Incentive Fund, which the governor proposed this spring and the legislature approved shortly thereafter. The fund can be used in "unforeseen or extraordinary circumstances" to encourage a Vermont business to create or retain jobs. "The governor has been in touch with the leadership of IBM and at GlobalFoundries to say, 'We're ready for a dialogue when you are.' They are very candid that they know the door is open with Gov. Shumlin, with his administration, but that they're not in a position to talk," Moulton said, adding later, "Our CEO, our governor, is in touch with their CEO, and that's the best communication we can ask for." Asked if that meant Shumlin had spoken directly with IBM CEO Virginia Rometty, Moulton walked her statement back, saying, "Well, I don't know exactly who, but our CEO is trying to reach out to their CEOs, if you will, to say we're ready for a dialogue. I don't have exact names of who he's spoken for." A spokeswoman for Shumlin did not immediately respond to a request for clarification. Nevertheless, Moulton sounded remarkably optimistic that the news out of IBM's Armonk, N.Y., headquarters would not be dire for Vermont. "I'm just going to say, my personal opinion is there's a heck of an asset in the facilities and the people there that I don't — I would be shocked if there was a complete announced closing of that plant," she said. Asked whether the the state should have a contingency plan prepared for such an outcome — just in case — Moulton said the administration would be ready. "But I sincerely doubt we're going to hear that announcement. I sincerely doubt that 4,000 people are going to get pink slips overnight," she said. "And so I believe there will be time to prepare if, in fact, there is a decision to close that plant. But here again, I just don't see it."